Sometimes cleaning some kitchen items can be tough. You want the utensils to be sparkling clean, yet you don’t want to destroy any part of them. If you have ever used a cast iron cookware, you must have faced some challenges while cleaning it. And you are probably wondering how you can clean and maintain it. You are in the right place. It’s easy to clean and keep it if you follow the correct procedure. Let’s have a look at the steps you need to develop. We will start with the method of cleaning it. In order to clean it, you need a bristle brush or a sponge, a cast iron skillet, vegetable oil, a dry towel and a stove or any source of heat. You should always wash your pan a few minutes after using it. However, you should let the pan cool before you start cleaning it. Ensure that you clear any food particles from it using a pan scraper, a spatula or a spoon. Add hot water in the pan until it is full. Heat the pan so that it can warm up. Avoid soaking it with water and leaving it for a long time in the sink so that you can clean it later. Doing this may subject it to rust. Take a bristle brush and use it to get rid of anything baked on it. Ensure that nothing is stuck on the pan. Shake off water from the pan and wipe it using a paper towel until it is dry. Take the pan back to the heat so that it can dry thoroughly. When it gets a little warm, sprinkle some small amount of vegetable oil on it. Alternatively, you can use a conditioning spray. You can then wipe the oil off the pan using a paper towel and use that paper towel to wipe out as well. When doing all these, keep in mind that your cast iron cookware shouldn’t be left with food or water for a while before washing it. When you clean it immediately after taking your meals, you won’t experience any issues like losing its non-stick finish. Maintaining a cast iron cookware well helps it last longer, and still appears new and shiny. Any careless handling will destroy its finish and reduce its quality. 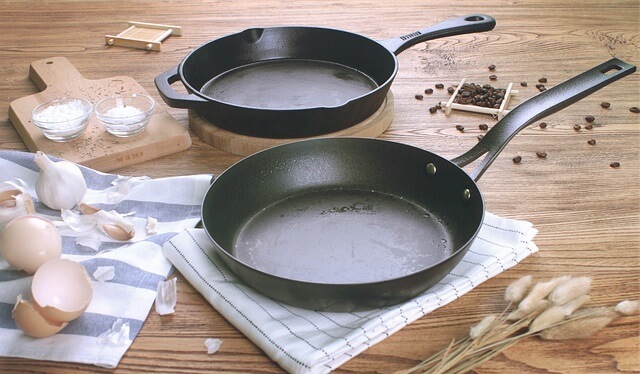 If you make a habit of seasoning the cast iron cookware well, you won’t have to use a large amount of soap to clean it, and this will make its finish last long. On the other hand, soap is known to be abrasive and using it may destroy the finish. Always season a new cast iron pan before using it. Seasoning is a protective and hard coating that is created on the pan by rubbing it with oil and heating it. When you rub it with oil and place it on heat, the oil layer becomes thin and looks like a plastic coating. This protects the pan from rusting which mostly occurs when it is exposed on air. When we mention seasoning, it doesn’t mean that you need to use salt. It involves applying oil or fat on the pan and heating it so that it can form a natural coating. Here are steps to follow to achieve that. Preheat your oven to a maximum temperature of 300°F. Put a foil layer beneath the rack of your oven then place the pan on the top shelf. Allow it to heat for 10 minutes then remove it. Return it on the oven for 10 minutes. Ensure that it doesn’t have excess oil by turning it upside down and then put it back to the oven’s top rack. Do this often to achieve a strong seasoning bond. In case your cookware gets rust, you can remove it by rubbing a raw potato on the rust together with baking soda or using a ball of steel wool. You can also re-season it after the cleaning process. Be cautious about using soap to clean this pan. You should use mild soap once to wash it that is after you have purchased it. You should also refrain from using harsh soap and cleaning pads when cleaning it as they can damage the seasoning. You should also avoid using a dishwasher to wash your pan. You should note that this pan is great for cooking different types of food. You need to start with foods that have high-fat content such as bacon so that they can help in seasoning and make the non-stick surface strong. Avoid using it to cook meals with high acid contents as they break down the seasoning on the surface of this pan. Before storing your iron cast cookware, you should note that moisture is the greatest enemy to any metal surface. You should ensure that you dry and oil it well so that it won’t have any traces of water or moisture. Store it a dry place. Keep the leads off from it so that it won’t get rust. In case of rust, always use steel wool to remove it and season the pan again. You might have thought that Cast iron cookware is not meant to last long since the moment you use them shortly they get rust or lose their finish. However, the secret is on how you maintain them. In a nutshell, you should season them well after buying them. You should also clean them immediately after use and season them again. Always oil them and store them in a dry place. The point is to avoid rust and even too much rubbing of their surface. I am a passionate drummer, guitarist, foodie and sous chef. While music is my profession, cooking is my passion and I can’t imagine life without it. My fancy for food began when I was little – as the son of a single mother, I watched with utter fascination as my mother turned out meal after delicious meal and I decided that I would do the same as well, no matter where life took me.